I’m a Walking School Bus Leader for Bear Creek Elementary School. Walking with the kids to and from school twice a week is my typical “super commuter” mode of transportation. But, I also walk or ride my bike to and from work and around town as often as I can to try my best to be a good example for them. About how far do you walk with the students as a WSB leader? We walk about ¾ of a mile on the way to and from school. Is there a particular reason why you choose to walk with students to school and back? I know I always feel better and more focused if I’m able to exercise and get fresh air before work, and I love being able to see the kids experience a similar feeling. Even just a 20-30 minute walk before and after school lets them release some energy and take a little break from the more structured school setting. I really can’t complain in any way about a job that allows me to go on a walk outdoors twice a day and get to better know the kids who I see at the Boys and Girls Club. The biggest challenges to date resulted from that big snowstorm we had in February. 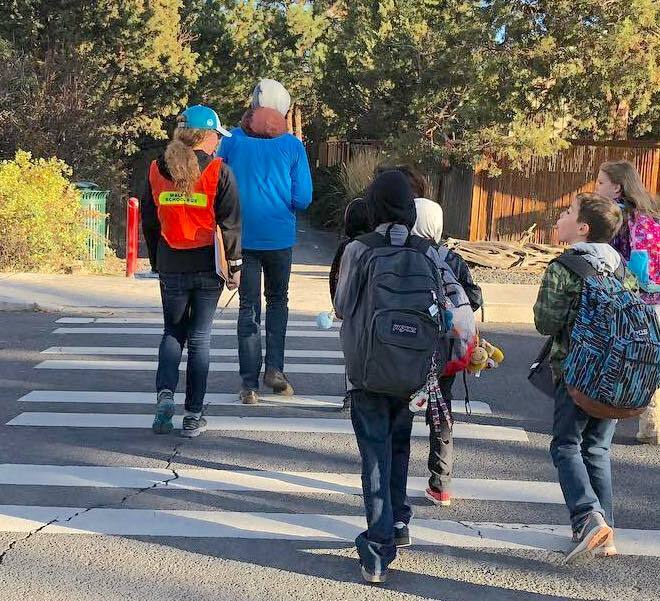 Unclear sidewalks made walking to school an unsafe option. School buses are not an option for most of the kids who participate in this Walking School Bus program, and many households in this area don’t own cars. Typically walking to school together is a safe and enjoyable option, so it was disappointing to be in a position when it was not. I always do my best to try and teach pedestrian safety tips to all of the kids. The Walking School Bus program is running year-round which is great. I was pleasantly surprised that the colder weather didn’t seem to discourage many students from participating. The dark and/or slippery conditions made it challenging for me to feel comfortable riding my bike through the winter, but I still tried to walk as often as possible to work (to Boys and Girls Club and the start of the Walking Schoolbus route). I moved here from Northern New York State, so I feel pretty lucky and spoiled by the sun here in Central Oregon no matter the month. Do you have any special tips for people who want to walk to and from school or work every day? If possible, try and find a route that is enjoyable to walk. Even if it’s not the shortest – things like a quieter street, or a trail, or nice scenery can help improve motivation to start a walking routine. The hardest thing is always getting out the door, once you are outside and moving you will realize what a great option it can be! Are there any other things that you want people to know? Whatever your inspiration is to walk or bike to work/school (getting exercise, reducing negative environmental impacts, saving money, etc.) keep it in mind. Regularly reminding yourself why you chose to do something and what you like most about it will likely help you remain motivated.